Filling out a job application may be the most important thing you do as you begin your quest for a law enforcement career. A poorly filled out application can mean the difference between moving forward in the hiring process or heading back to the unemployment line. 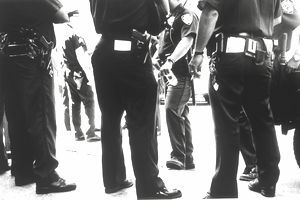 Typically, law enforcement agencies have very objective hiring standards. The process to get hired as a police officer is broken into distinct steps, with clear pass/fail rules and guidelines. In general, if you can make it through all of those hoops, the chances are pretty good that you'll get hired. The job application is the first of these hoops, which means it may be the most important. Without it, you won't even get your foot in the door. There are so many people looking for criminal justice careers who miss out on great opportunities because they made simple mistakes in their job applications. Sometimes, they don't know what information they need to include. More often, they fail to properly articulate that they have the required education or work experience. Think of the job application as your first opportunity to introduce yourself to your potential employer. Remember, first impressions matter. The care you take in preparing your job application will say a lot about how seriously you take the job you're applying for. By extension, it will also speak to your discipline, professionalism, and ability to represent your agency. While a sloppy application, if properly completed, won't necessarily get you disqualified, it may very easily find itself at the bottom of the stack and in "job application purgatory." Type your application whenever you can do so. There are several programs available that can convert PDF files into fillable forms if you don't have access to a typewriter. In many cases, though, departments will provide an electronic application that you can complete, print and mail. Even better, apply online whenever possible. It will ensure your application gets to the right person as soon as possible and will eliminate any accidents such as spills, tears or wrinkles, that can happen to a physical application on its way to its final destination. If you're honest with yourself, there's probably been a time or two when you just started filling forms out without regard to the instructions, only to find out that you wrote something in the wrong format or didn't understand what information was requested until it was too late. Believe it or not, this happens all the time with job applications. Unfortunately, in people's haste, they often neglect to look and see that they not only filled their application out completely but correctly as well. This simple mistake can have big consequences. Failing to read the directions for the different sections completely before you fill out your application can send the wrong message to your potential employer. When you don't read the application, you're essentially telling the recruiter or hiring manager that you can't follow instructions, which, as you can imagine, is a less than desirable trait in a future law enforcement officer. Many agencies have very specific requirements regarding work experience, military service, and education. Quite often, these requirements are set by the state POST or standards and training commission, which means the agency has little to no leeway in bending the requirements. What this means for you as a criminal justice job seeker is that you must be able to articulate how your experience relates to the job you're applying for. For example, if an agency requires that a candidate must have 2 years of public-contact work experience, then when you fill out the prior employment history portion of the application, use the "job duties" sections under each of your previous jobs to demonstrate how you had to make contact with the public as part of your normal duties. After you've applied, it's a good practice to call the employer and ask if they received your application. It demonstrates interest, follow-through, and dedication. Don't get discouraged if the person on the other end sounds annoyed or uninterested. Remember that they often receive hundreds of applications in a week or even a day. Even so, they'll remember you as one of the people who wanted the job. Moreover, if you don't follow up, you may never know if your application got to the intended recipient. It's far better to call and be sure they received it than to be left wondering. Completing the job application neatly, thoroughly and accurately is vital if you want to get a good start on your law enforcement career. The job application is your first chance to tell your potential employer exactly who you are and what you can offer. Don't be in a rush to fill it out. Remember: make it neat and legible, follow directions, properly articulate your experience and follow up after you send your application in. Following these simple steps can make a huge difference in your chance of success in your criminology career.